Many of you will know that I am in the fortunate position of being paid when I speak at events (not always ,but often!). I thought I’d give those of you who have similar aspirations some advice which I hope will be helpful. When you first launch yourself on the speaking circuit take everything you are offered. Get in front of as many different audiences as you can. Aim to get yourself recognized as an expert in your field. Think about subjects that you could speak about which would engage a range of audiences. Work up talks of different lengths – 10 mins, 20 mins, 30 mins. Have some with visual aids and some you can deliver without. Start with business networking groups, rotary clubs, W.I. and similar. Sometimes you will get a meal in payment! Tell everyone you connect with that you are interested in speaking. When you have sufficient experience let people know that you have speeches to offer for regional business seminars and conferences. You now need 45 mins, I hour and 1½ hour presentations. Prepare practical seminars and formal audience addresses. For large audience speeches,some form of PowerPoint presentation may be advantageous but if you can interact with your audience you may not need this. 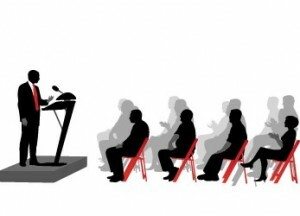 Conferences usually require keynote speakers and seminar leaders so be prepared to do either. When you get to this level you can expect payment. Research what current fees are likely to be and pitch yours at a reasonable level. No one is going top pay you ‘top dollar’ until you prove your worth. When you have spoken at a conference you are likely to get bookings from companies who were present, for internal seminars, workshops or event speaking. Once people hear you speak at an event and find you deliver what you promised, you will get more bookings. Use the skills you have to speak at lots of other events too. Do you have any non-business topics that would be of interest to arts or sport organisations? Why not do what I did and apply to be a guest speaker on cruise ships? The WORLD can be your oyster! Look good – dress appropriately. SOUND good – be heard, be distinct, be interesting vocally. There is no substitute for practice, so get out there and find yourself an audience.